In anticipation of a solitary road trip, I headed to the library for an audio book. 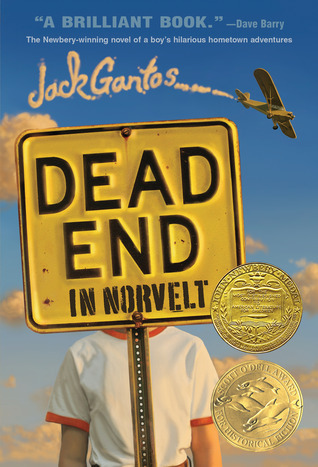 Dead End in Norvelt by Jack Gantos caught my eye, in part due to these lines in the description: “melding the entirely true and the wildly fictional.” Now, this was something that would make the miles pass faster. As luck would have it, the road trip got cancelled, so instead I listened to it in fits and bursts during my regular commutes and while cooking. This is definitely not the best way to enjoy an audio book, and sometimes days would pass before I was able to listen to the next chapter. And there were times that I really wished I had been reading it, as there were some really, really good lines about history. This book won the Newbery in 2012, and that award wasn’t well received by many critics. I don’t pretend to be able to keep up with all the books in the running each year, so I won’t give an opinion on its worthiness. Though this book wasn’t perfect, it does meet all my requirements for quality historical fiction. It’s funny. It has a good story. It makes you want to find out more (I totally did some research on the history of Norvelt). And it contains lots of details that you just might not include if your only knowledge of the time period was through research. Do I think Jack will have the staying power of Laura and Betsy? Probably not, but it was fun to get to know him. And as a historian, it fills a great spot on the timeline of childhood during the 20th century. With baby boomers’ strong tendency towards self reflection, I’m surprised that there aren’t more books like this being published. Or perhaps I’m just missing them? Who might be the next Laura or Betsy? As technology marches on, childhood in the 1950s or 1960s is becoming more and more foreign, and it seems like this should be a booming sub-genre of children’s literature. And honestly, after reading a lot of YA fantasy, it was a relief to be in a world for a while with no supernatural happenings. Who else is writing fictionalized autobiographies for a young audience? Is there a Laura for the mid-late 20th century waiting in the wings? Now that the hustle and bustle of Christmas is past (and I look forward to lots of lazy yet productive days at home), I’ve started doing my annual sorting and cleaning throughout the house. And somehow, that always includes looking back at my year in books. Below are a few favorite kidlit history books of 2012. For my complete list of books, feel free to find me on goodreads. Past Perfect by Leila Sales. (read in February 2012) Technically, it’s not kidlit history. But it’s set at a living history museum, and it is absolutely hysterical. I wrote about it in more depth here. Dandelion Cottage by Carroll Watson Rankin. (read in March 2012). I admit it–I have weakness for books about kids fixing up houses. From Laurie and the Yellow Curtains to Jane of Lantern Hill to Gone-Away Lake to Andrew Henry’s Meadow, Dandelion Cottage is another great example of youngsters given a space to call their own. This one made the blog as well. Code Name Verity by Elizabeth Wein. (read in August 2012). Probably my favorite book of 2012. Tight plot, believable characters, twists that will leave you gasping for air. And it’s all about a somewhat forgotten area of history–women serving as pilots and spies during WWII. And if all this makes you want to learn more, be sure to check out Flygirl by Sherri Smith (which I read in 2011). Bicycle Madness by Jane Kurtz. (read in September 2012). A quite little book of historical fiction that will capture your heart. More on it here. Little Women by Louisa May Alcott. (read in October 2012). I first read Little Women when I was probably 8 or 9. I only made it through the first half–things got too mushy for my tastes when Meg married. And though I’ve returned to it several times over the years, have visited Orchard House twice, read all sorts of things about the Alcott family, and explored several of Louisa’s lesser known works, it’s been a very long time since I’ve read Little Women. It’s a classic for a reason, and if you haven’t read it in a while, I highly encourage you to. One of the very few kidlit history books about the Civil War, in many ways, the book could be set in any time and any place–it’s so much about the struggle to grow up and become a woman. More on it here. The River Between Us by Richard Peck. (read in November 2012) Yet again, Peck proves himself to be a master of historical fiction. A Civil War tale, but as much about the unique racial situation in New Orleans. And it’s got a stellar love story as well. One of these days, I just need to sit down and read all of Peck’s books, because I don’t think he’s ever disappointed me. What were some of your favorites in 2012? I’ve felt like I neglected my blog this year, and yet, I see that I’ve written about almost all of my favorite kidlit history books of 2012. That being said, I’ve already decided that my resolution for 2013 will be to write more. That writing won’t just be here, but I definitely need to get back in that writing habit. Here’s to more great reads in 2013! And then, they later suggest acting out scenes from Little Women as an activity to complete the badge. What fun! Now, I’ve been using kidlit themes for our annual Girl Scout days for a few years now. We did Betsy-Tacy back in 2010 and Little House in 2011. But I won’t claim that somehow GSUSA used my ideas as a basis for this tiny piece of their new badge program. However, maybe it’s another sign of the growing realization that fiction is an important tool for historians. This research consistently shows that fiction does mold us. The more deeply we are cast under a story’s spell, the more potent its influence. In fact, fiction seems to be more effective at changing beliefs than nonfiction, which is designed to persuade through argument and evidence. Studies show that when we read nonfiction, we read with our shields up. We are critical and skeptical. But when we are absorbed in a story, we drop our intellectual guard. We are moved emotionally, and this seems to make us rubbery and easy to shape. . .
Fiction enhances our ability to understand other people. Isn’t that beautiful? And for anyone that’s a reader, it’s not a big surprise. Yet, we need scientific studies to explain this to non-readers. And then, just today, I was reading an article in an academic journal that talked about how emotion should be a bigger part of public history. These threads are starting to connect. All this to say that I no longer feel quite so crazy for believing that one of the best ways to inspire a love of history in folks of all ages is through fiction. People need stories to connect. Suddenly, history isn’t so distant. The people that live d in the past don’t seem so strange. And for someone that works in a field that seems to be bottoming out (all sorts of studies indicate that attendance at history museums is at an all-time low), this is important. So, though I haven’t been posting quite as often here, I like to think that I’m fighting the good fight. For two different upcoming events, I’ll be drawing on children’s literature to explore some larger historical themes. Who knows–maybe all of you will get a sneak peak. Last week, mom brought another box of stuff to my house for me to go through. It is truly remarkable what all she hung on to (and a lot of it is now in the recycle bin). But I did find a few things that prove that my reading tastes haven’t changed that much in the last 20 or so years. Meet Theodore Roosevelt (I’m currently reading the gigantic Edmund Morris bio of Teddy). The only thing that appears to be missing is anything by L. M. Montgomery. Yeah, I’m still working on that one, though the list has greatly expanded to include first editions. But still! I just love your books and think I would make an excellent character. I’m smart, a talented writer, and full of mischief. I have many adventures and misadventures. My friends are almost as nice as me. The book could have stuff in it about goals and mischief. I also have a short temper which would make quite a few interesting chapters. As you can see, my life could easily be turned into a best seller. Ummm, yeah. I didn’t have an ego at all! But it is obvious that the love was quite deep.